His response made me throw my hands up in the air and give out a sigh of "Well.. I don't think he's even aware of what he's suggesting.."
I didn't bother following up this vapid (the words, not him) response because.. what's there to say to someone who just proclaimed an lack of interest in investigation and methods of determining truth? It also comes across as one of the 'pretentious theist responses' by including "attempts at finding God" as if the many fields of science are actually directly concerned with a Yahweh character. Now, that's not what he was suggesting, he was talking more about an individual's faith and personal beliefs and all that good stuff that makes for an intellectually caffeine-free TED talk. This post is not about him, but about the general sentiment his words carry. It's about the ignorance that faith/religion makes good use of and often fosters. To make it clear upfront, I'm using ignorance in its descriptive fashion of "lack of information." I try to avoid using the word ignorant as an insult and try to keep it as a descriptive label. I apply the label to myself often- there's a lot I don't know about and will never know about! Concerning topics such as automobile maintenance, bioethics, calligraphy, and engineering I'm very ignorant! I'm not staking a claim to any intellectual superiority here. The stack of paper alone containing the list of living people who are more intelligent than me would probably crush me alive. I'm not calling all religious people ignorant. Theists comprise of many of the world's greatest minds, past and present. Anyone who says "religious people are crazy" are generalizing in a very rude manner and are probably not interested in any useful dialogue. 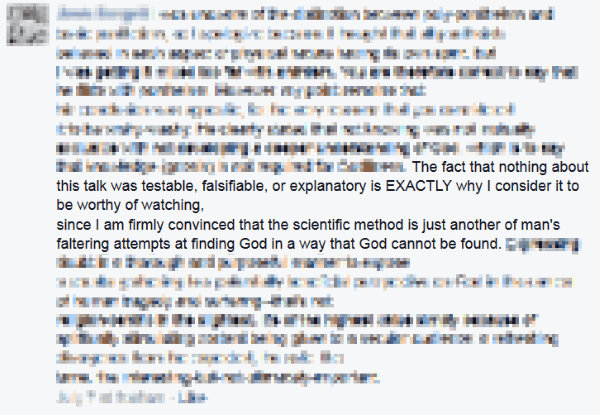 My friend slammed on the scientific method (again, I doubt he even considered what such a mindset even entails) but I put forth that he'd be all about the scientific method if it backed up his theistic claims about a god! But often rational investigation, skepticism, methods of determining what you hold is actually true isn't a fostered mindset in relation to religious beliefs. 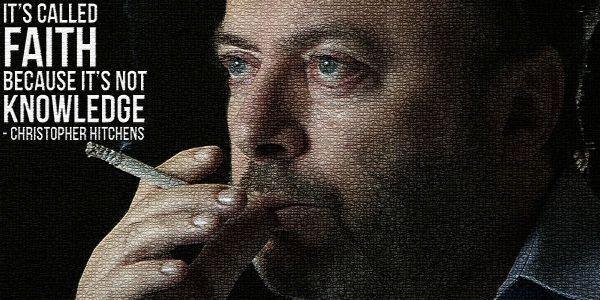 I'm not calling religious people dumb or anything like that, but if you accept the Bible as literal truth (or perfect) and don't acknowledge that it's riddled with inconsistencies and outright untruths then I don't think you apply much inward inspection concerning religious values you hold to be true. Sacred cows are useless, "blaspheme" and "sacred" are simply words used to dissuade critical thinking through fear. 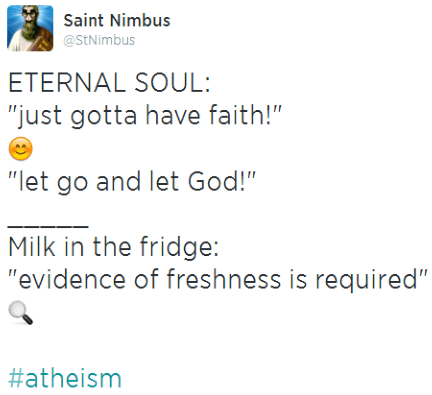 "You just gotta have faith", "you have to trust God" are typically inevitable tropes when you press someone to demonstrate the truthfulness of their theistic claims. It quickly becomes apparent that a theists' beliefs concerning a god are often built on a foundation of hope and not anything demonstrable. Trust has to be gained and maintained, and... it'd be damn silly of me to place trust in a character that hasn't been demonstrated to me to even exist. Let's take some of that good ol' faith and apply it to other aspects of our lives! Blessed are those that cross an intersection without looking. Blessed are those who accept candy and drugs from strangers. Blessed are those who don't lock their door when they leave their home or vehicle. Blessed are those who feed their kid whatever random strangers give to them. A few bits I heard from time to time in church was "faith" used in reference to science, sitting on a chair, riding on airplane and silly rhetorical stretches like that. Science would make no use of faith.. that's patently obvious. A calculator doesn't output based on faith, its existence alone is a monolith to the success of scientific repetition. Internet infrastructure is the result of many different folks correctly understanding various aspects about the physics of the universe we inhabit- any inclusion of faith would only serve to guarantee failures. Not that these insultingly-thoughtless pulpit sound bites deserve a response, buuuuut~ Sitting in a chair is a regular exercise; a basic understanding of matter (I've yet to phase through a door) and the consistency of past experiences grants you a pretty grand certainty that a sturdy-looking chair won't collapse the moment your seat hits the seat. Same goes for the airplanes- decades of research, testing, mistakes, advances in our understanding of physics, all this and more allow me to get on a plane and feel comfortably assured that I'll make it to my destination alive. As Seth Andrews (The Thinking Atheist) put it near the end of his talk The Ultimate Question, "Faith isn't a virtue, it's something to be pitied." To put it sincerely, faith is a type of gullibility. Faith is a dead end for inquiry. I'm fine with people saying they have faith, as long as they are willing to acknowledge that faith means squat concerning the truthfulness of what they have faith in. If you can't present anything measurable, observable, if you have no good evidence to back up a claim-- you aren't professing truths you're professing what you hope to be true. To stick one final quote into this post, what Nietzsche said of faith reflects my views on the nonuniform, contradictory theistic claims of personal confidence in the supernatural: "A casual stroll through an insane asylum shows that faith does not prove anything." If you're one to not care about methods of determining truth, fine. You're free to not care about finding out if your beliefs and stances coincide with reality-- and the rest of us are to be encouraged to not put much stock in any claims you make. If you "have faith" or "live by faith", fine, but your faith/hope in any claims you make isn't indicative of anything other than your confidence. I'm gonna finish this by touching on a typical rebuttal to the practice of faith being challenged. A common knee-jerk reaction is the accusation (funny enough, inadvertently depreciating "faith" in the process) "Atheists/scientists just have faith in science instead." No. Faith is useless in science. A scientist can certainly hope for certain outcomes, but faith plays no part in realizing anything useful from an experiment or procedure.